Dripping Springs might not be the biggest city in Texas, but big things are happening at its only high school. As a school that is totally committed to providing students with challenging learning opportunities in science, technology, and math, the programming and engineering classes of teacher Jad Jadeja continue to impress. Not only have his students competed in multiple statewide events, but they have also advanced to national level competitions and now find themselves heading to a world competition in Dubai in December. 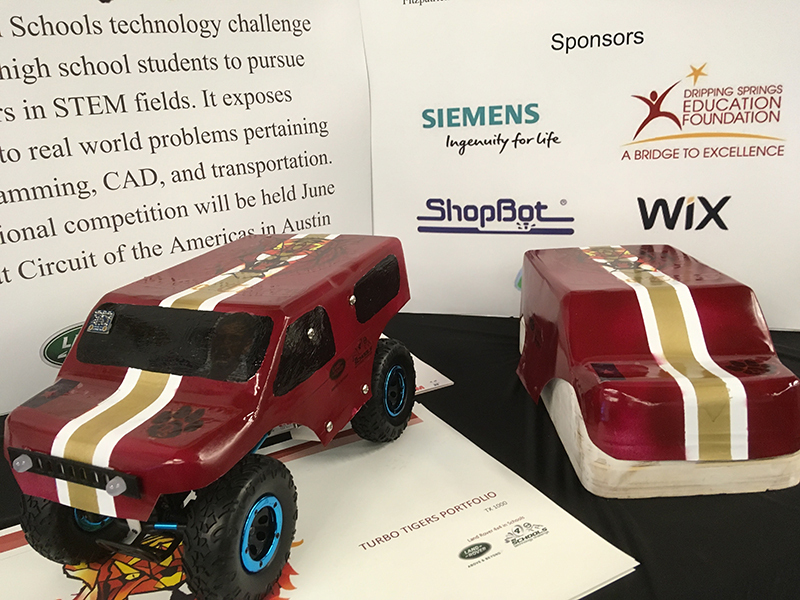 This past school year, Dripping Springs High School (DSHS) was awarded the title of Fab Lab from MIT. According to the official press release “Jad Jadeja’s room has been officially designated as a Fab Lab.” Of the 700+ Fab Labs worldwide, DSHS is the only high school in Texas to achieve this status. Part of attaining this designation involves providing a hands-on environment that takes a project from an idea all the way to a working model. This process involves not only learning engineering principles, but applying them using the latest technology. Students are required to learn how to use a variety of hi-tech equipment like 3D printers and CNC machines. As part of the design process, the students learned how to use software such as SolidWorks, Solid Edge, and Aspire. After the design process came fabrication—and this is where Jad’s two ShopBot CNC machines (a ShopBot Buddy and a Desktop) played a critical role. Whether cutting wood, composite materials, acrylic, or aluminum, it seems that no project was too big or small for the ShopBot tools. Jad would be the first to say that not only did the machines work well, but ShopBot provided a great deal of support during the design and fabrication phase of each project. Over the past two years, many students in Jad’s programming and robotics classes have completed certifications in SolidWorks, Solid Edge (this year), ShopBot* (including Aspire training), LabVIEW, and OSHA. 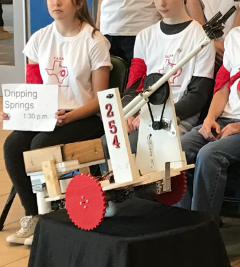 Last December, Jad’s students competed at the UIL Best Robotics Competition that included 5-A and 6-A schools from Texas, New Mexico, and Oklahoma. 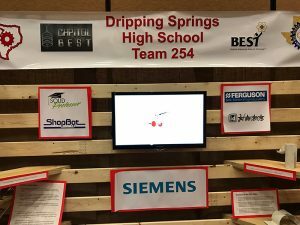 The students placed 6th in the state of Texas event and came in 15th overall. Approximately 80% of their robot was built using one of the ShopBots! In addition, another engineering teacher at Jad’s school enlisted his students’ support in cutting out aluminum parts on one of the ShopBots for the FIRST Robotics Competition. Innovative Airflow Technologies team in front of their booth at the competition. 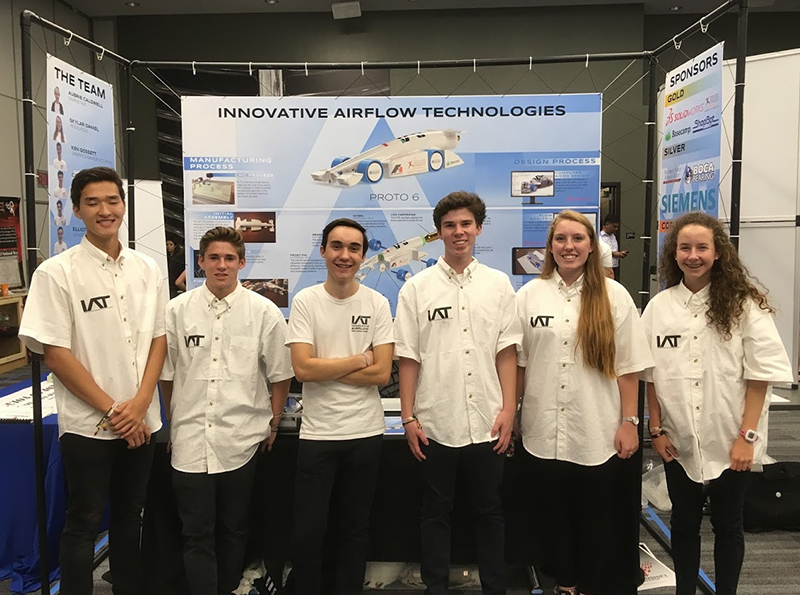 In January 2017, the success continued with the Innovative Airflow Technologies team of Aubrie Caldwell, Skylar Daniel, Ken Gossett, Cade Nowicki, and Elliott Turner. They placed high enough at the Texas F1 in Schools state competition in Austin to advance to national competition in Austin in June. F1 competitions include a complete race car, 3D designed to contest specs, and then fabrication of the car out of an expanded PVC block of material. The race car is then painted, and tires installed. Powered by CO2 cartridges, the cars compete (two at a time) on a 25-meter race track where the fastest times are recorded. The Innovative Airflow team employed the ShopBot rotary indexer to do four-sided machining while carving their race car on the ShopBot Desktop. In addition to designing and building an F1 race car, the team must also put together a display, project portfolio, and a marketing plan, which they then use to make an oral presentation to the judges at competition. As a little tune-up for Nationals, the Innovative Airflow Technologies team made a presentation at this year’s Austin Camp ShopBot to the delight of the attending ShopBotters. Innovative Airflow Technologies’ vehicle design for the competition. In addition to the F1 competition at state, there also was a 4×4 in Schools Challenge competition. The Turbo Tigers team of Ben Marsan, Henry Windsor, Cole Scott, Bryce Fitzpatrick, and Jason Fitzpatrick advanced to national competition as well. Members of the Turbo Tigers team. 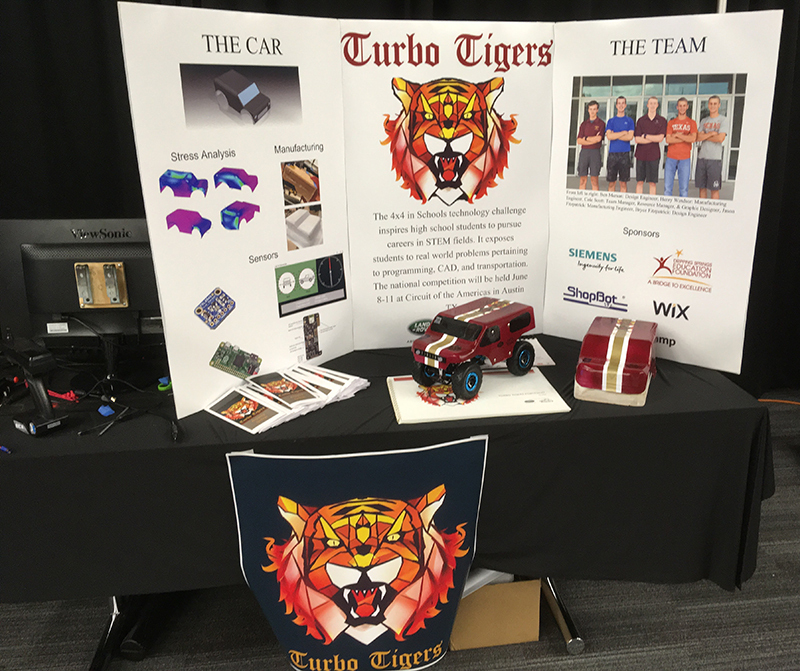 The Turbo Tigers team had requirements similar to those of the Innovative Airflow Technologies team, in regard to project design and fabrication, creating a display featuring some of the steps taken, and the requirement of a portfolio and oral presentation. Their remote controlled 4×4 had some unique features, including one feature that only this team had: telemetry. An embedded microprocessor in the car sent roll and pitch, temperature, altitude, and GPS data to an application the students monitored on a PC. The data was then converted into graphical displays. From the GPS data students could locate the car using an application like Google Maps, and then visually display the location on a map in real time. The Turbo Tigers’ competition display. One of the greatest challenges in the competition is navigating an extremely difficult obstacle course with your 4×4. The Turbo Tigers used a ShopBot to build the body for their 4×4. After importing their 3D model into Cut3D software, they sliced the model into three layers. They then used the ShopBot to cut the parts, glued them together, and sanded the entire mold for the car. Using a vacuum hold-down jig, heated plastic was vacuum formed around the mold and that was then removed and painted. 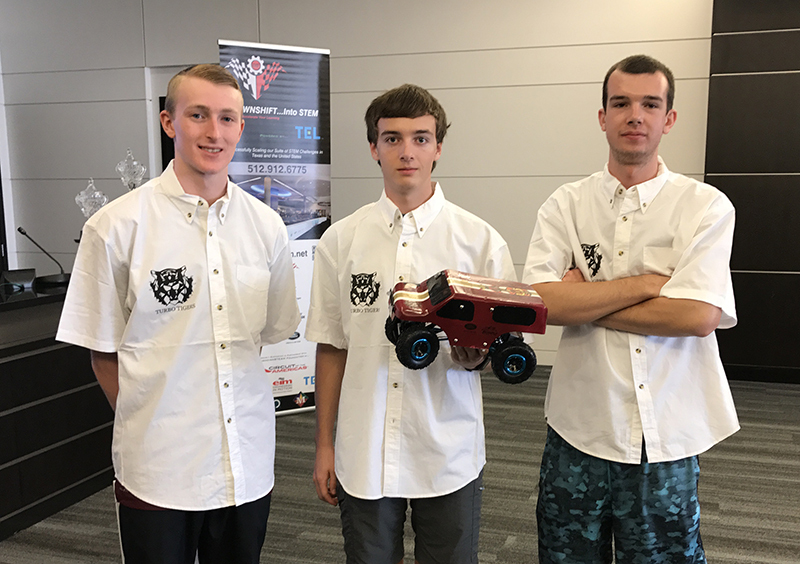 Even though they faced stiff competition at nationals, the Turbo Tigers placed 2nd and qualified for the 4×4 World Competition in December, held in Abu Dhabi. Click here to see video from the first day of the World Competition. The Turbo Tigers entry into the 4×4 competition. Every time you think that Jad Jadeja’s students have reached their limit, they are off to another incredibly challenging project. 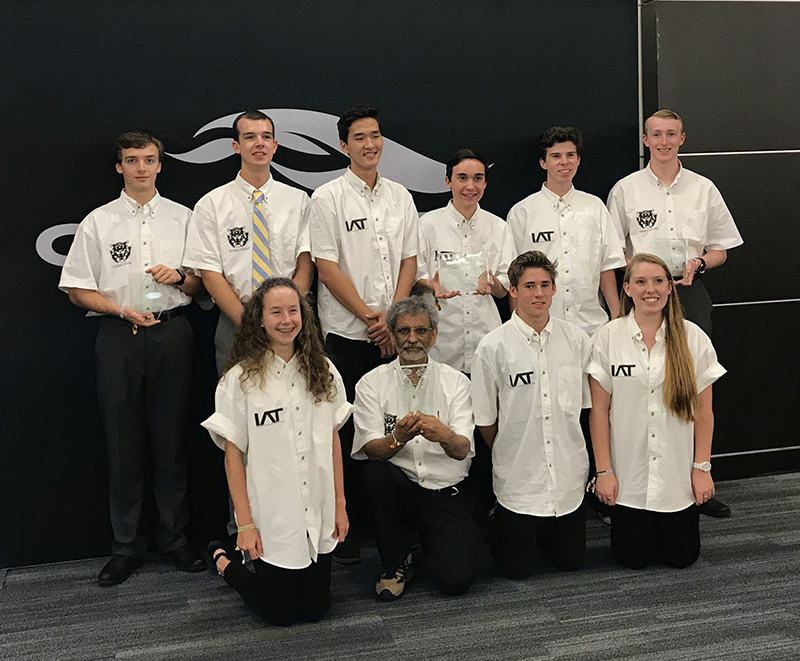 This past year they started the preliminary work in building a solar car for the National Solar Challenge that will occur later this school year. In addition, the school has introduced an internationally recognized soldering certification program. From being the first official Fab Lab High School in Texas, to advancing to national competitions in a variety of areas, to helping cut the parts for the school’s robot used in the FRC World Championship, to qualifying for the world 4×4 competition, Jad, his students, and his two ShopBot tools keep taking more territory every year. It looks like they will all have to make sure their passports are up to date – they are going to go far!